__NOTOC__[[Image:GET LAMP Package.jpg|right|250px|Cover art for GET LAMP. ]]'''Get Lamp: The Text Adventure Documentary''' (http://www.getlamp.com/) is an upcoming film project by [[Jason Scott]], Filmed between 2006-2008 and to be released in 2010. Filming started in February of 2006 with an interview of [[Mike Berlyn]], with pre-production research taking place at least a year before that. __NOTOC__[[Image:GET LAMP Package.jpg|right|250px|Cover art for GET LAMP. 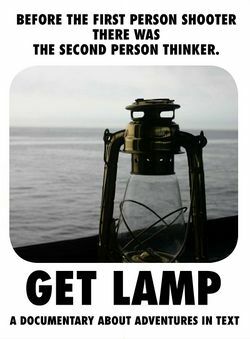 ]]'''Get Lamp: The Text Adventure Documentary''' (http://www.getlamp.com/) is an documentary film project by [[Jason Scott]], Filmed between 2006-2008 and released in 2010. Filming started in February of 2006 with an interview of [[Mike Berlyn]], with pre-production research taking place at least a year before that.